Vinny came back from Korea yesterday. He was there shooting pick-ups for the pilot he shot back in September. As if I needed further proof of how awesome he is - he brought back about 40 lbs of candy for me, along with some other awesome presents. 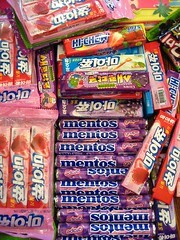 If I haven't waxed poetic about grape flavored mentos before, let me take a moment to do so now: THEY ARE SO GOOD! I found them in Tokyo and spent a lot of time yelling WHY DON'T WE HAVE THESE?! I also bought cassis flavored, which are also VERY good - but the grape is just sublime. When I got home from Tokyo, I realized that I had not bought enough grape mentos for my stash, and skyped Vinny to ask him to pick up more, please. The stash was just starting to run low when Vinny found out he was headed back to Seoul again, and so I asked him if he would please get me more. Over New Year's, I had tried the chewy things you see there in the picture on the left and found them weird, but delightful, and so I asked for a couple of those should he spot them again, too. I don't know how to describe them. They aren't as tangy and bursting with flavor, like say, your starburst - but they aren't boring either - they are more of a taffy in terms of consistency - almost creamy/chewy. As near as I can guess, they are made of some kind of plastic or polymer, because after you eat a pack, you can feel them forming a giant ball of rubber in your stomach. A rubber ball that is seemingly impervious to stomach acid. This is an important detail to me - it's also why I like Twizzlers. What I like about the candy in Japan and Korea that I have taste tested is the fact that they usually have a little character on the package that lets you know if it is sour -- usually by squeezing it's eyes together or making a puckered mouth - you can see that very expression on the grapes pictured on the pack of chews above the mentos. Imagine if you came to the US and didn't speak English, and decided to blind taste test a package of sour patch kids the way I blind taste tested all the Japanese and Korean candy? Those kids have their eyes WIDE open! You'd have no way of knowing that your taste buds were about to be burned off and the roof of your mouth ripped up! Another thing that Vinny brought back from Korea in October, that I was *very* into for a while is an introduction to CyWorld. It's big in Korea and launched here in the US only recently. You create a "minime" that lives in your "minihome" that you decorate as you want it to look. You buy the things for your minihome in the shop section using acorns that you buy with real cash money. They start you off with some free acorns to use, and I discovered that if you took a survey they would give you more free acorns - so I managed to buy some things for my minihome without spending actual cash. Oh, and with some gifts from friends - of which I only had 3, who lived in my "neighborhood". I don't think cyworld is really going to take off here in the US - in fact, my 3 friends and I laughed and laughed about those silly Koreans thinking that American people would fall for some dumb website where you had to BUY acorns to pimp out your page! I mean, aren't Americans all waaaay too busy messing around with html code that they don't understand, and uglifying their myspace pages for free? I say yes. But then... we had so much fun buying each other extravagant gifts like lions and penguins and probe robots, that eventually I ponied up five dollars to get more acorns. I think I may have brought shame on my family. But my minihome looks GREAT! Come on by... I left the Christmas tree out for you!